Hi everyone! Today's post is a link-up of sorts. I am in the Pipe Dream Polish fan group on Facebook and recently we decided it would be cool to do a group mani each following the same prompt using either polishes from the A Night in Vegas Cremes (ANIVC) or Street Carnival Collection (SCC)! This was perfect because my SCC collection has been waiting patiently on my desk for me to play with! I used Harlequin in this mani here but hadn't yet had a chance to try out the others. So the prompt for the mani was a skittlette with a 3 colour gradient and black and clear watermarble on two of our nails, a creme on the pointer and a glitter on the little fingernail. For my gradient I picked out Celebration (blue), Harlequin (purple) and Masquerader (pink) and used a triangular cosmetic sponge to apply them. I didn't bother using a white base because these are so perfect and opaque that it's not necessary. I then used Pipe Dream Polish Clearwater, a clear polish designed for watermarbling, and A England Camelot to do the marble over the top. I applied Celebration to my pointer fingers and Masquerader on my thumbs. Unfortunately I do not own any Pipe Dream Polish glitters so I used a loose nail art glitter from LA Splash for my little fingers. The colour is 'Onyx' and it is a mix of very fine and larger iridescent glitters. I dusted it over a coat of clear polish and sealed with topcoat. This was a fun mani to wear for sure! I don't often do skittlettes! What do you think of this mani? Are you a Pipe Dream Polish fan too? Thank you to Selina (@nailsbyselina) for organising this! It was fun! Hi everyone! Today I'm super excited to show you the gorgeous Little Rebel Droid from Pahlish. I'll apologise in advance because this one was a Limited Edition free with purchase for Black Friday weekend and is no longer available. This is an amazing polish though, a blue jelly with multichrome flakes. It is so deep and amazing. I really love it! I decided it would pair up perfectly with Poppin Bottles, the NYE polish from Paint Box Polish! I wasn't wrong I don't think! I used 2 coats of Little Rebel Droid on all of my nails except my ring fingers, where I used 2 coats of Poppin Bottles. The formula on both was on the thicker side but nothing unmanageable for either. You can't really see too well because of my nail art but Poppin Bottles is a clear base packed with various gold holographic glitters and flakies! For the design on my accent nails I used blue acrylic paint and a fine detail brush to freehand a swirl design, framing the nail in the process, adding some dots with a dotting tool at the end. I took inspiration from this design by Tartofraises. As usual, I finished everything off with my regular topcoat. I think I could have used another coat on the accent nail because I found that the glitter was a bit topcoat hungry. But it was still quite smooth to the touch, nothing too bad. What do you think of this mani? Did you pick up either of these polishes? Again, sorry neither are available to purchase now but do check out all the other lovely creations from Pahlish and Paint Box Polish. Hi everyone! Today I have a Girly Bits prototype swatch for you. I was really lucky a little while ago and won a giveaway Pam ran in her fan groups on Facebook and this polish was part of the prize! I'll apologise in advance as this one is not available to purchase. However, Pam has started doing Mystery Packs of polishes which include 3 full size polishes (including discontinued polishes, un released colours, oopsies, SBP's, or exclusives from collaborations, A Box Indied or other sub boxes, one of a kind samples, limited editions, or prototypes) and a mini nail care product of your choice. You can also note your colour/finish preferences which will be taken into account if possible! The Mystery Packs are fairly new to the Girly Bits site and will be available almost all of the time, basically as long as Pam has a good selection of polishes to put in them! There are also Sample sales 2-3 times a year. So back to Prototype 688! This is a beautiful green with a bit of holo and holographic microglitter! It is really stunning and I love it on me. I love how Pam creates such unique finishes! I used 2 coats of Prototype 688 and a coat of topcoat. The formula and application were perfect. What do you think of this one? I'm definitely going to be picking up a Mystery Pack sometime soon to have more beauties like this that are a little bit special! Hi everyone! I can't believe that today is already Day 5 of my first Digit-al Dozen week! I have loved participating and seeing what all the other ladies have done based on this theme! I'll certainly be looking forward to DD week every month! Today I chose to do anothern new-to-me technique. This is what i'll call magnetic abstract. I recently saw some magnetic manis by The Swatchaholic on Instagram and really wanted to give it a go! So I pulled out the few magnetic polishes I own and decided to use the OPI Skyfall magnetic trio. These were released as an add-on to the 2012 Skyfall collection. Each colour came with a different pattern magnet (I didn't use those magnets for this mani though, more on that after). Morning, Moneypenny is a magenta with holographic microglitter! I really love this colour, even without using a magnet on it. Is That Silva? is a charcoal grey also with microglitter and Bond...James Bond is a pretty bronze/gold shade. To create this design, I started out with two coats of OPI Black Satin and when the second coat was wet, I added blobs of each magnetic polish, like you might do for a blobbicure or a saran wrap mani. I then used my squishy stamper to squish the colours together a bit, then used a magnet (a strong magnet from my fridge) to magnetize the colours and create a shift in colour. The most important thing is to work quickly. I finished everything off with a coat of topcoat as always. I really love how this turned out and I might play with this technique soon. Though I only have a limited number of magnetic polishes...Thanks for the inspiration, Jeanette (Swatchaholic)! OPI - various retailers although I'm afraid this magnetic trio was limited edition. Sorry. So there it is, my last design for New & Improved week. I hope you enjoyed the posts and will check out what the other DD ladies came up with this week! Hi everyone! It's Day 4 of New and Improved week and for today I tried a technique I'd never done before, leadlighting. I've admired it on other people for ages but as stamping isn't my most favourite technique, I just never got around to trying it for myself! Basically, leadlighting involves stamping over a light base, then filling in spaces in the design with sheer polishes. It's like colouring in! I actually found this technique quite relaxing and fun (after wanting to throw my stamper out of the window that is, because it keeps falling out of the holder!). I started out my mani with 2 coats of China Glaze Glistening Snow, a super fine holographic silver glitter from the 2012 Holiday Joy collection. I then used my Konad black stamping polish and the Moyou Pro 06 plate to stamp the design and filled in with some colours from the Color Club Take Wing collection using a dotting tool. Wing Fling is the pink, Metamorphosis is the green, Sparkle and Soar is the orange, Sky High is the blue and Daisy Does It is the yellow. I love this collection and doing this mani has reminded me how much. I really need to play with them some more now! I really loved this mani I don't think its too bad for my first attempt at leadlighting. I'll definitely be trying this technique again soon! I just need some more stamping plates with designs that are good for it (any excuse huh??). Don't forget to check out what the other lovely Digit-al Dozen ladies have done today! Hi everyone! So today is Day 3 of New and Improved week for The Digit-al Dozen! I decided to pull out some foils and experiment a bit using them over a whole nail...or close! I usually use foils in small touches or designs but I thought why not try replacing polish with foil and apply them over the whole of my nail combined with some negative space. So I started out by applying foil adhesive on all of my nails, leaving a space at the base. I then applied my foil and added dots of Sinful Colors Black on Black with a dotting tool. I finished with a coat of Tammy Taylor A+ topcoat which I swear usually works perfectly with foils for me. Yet on a larger surface, it did dull and crackle the foil slightly. I should have used a water-based one like I sometimes do but the wear is terrible on them in my experience. I kind of like how this mani looks anyway but I'll admit I was a little disappointed. I'll call this mani more 'new' than 'improved'! The texture does remind me of chocolate wrappers, like on Ferrero Rochers! Don't forget to check out what the other Digit-al Dozen ladies have done for today! Hi everyone! For day 2 of New and Improved week I've done a dry brush mani! I have done dry brush manis before but I've never actually blogged one. This is mainly because they are not my favourite type of nail art. I often like the look on other people but hadn't found much love for it on myself yet. I think this dry brush mani has completely changed my opinion. It is an improved version of the past dry brush manis I have done and that is because of the colours. What I typically don't like about dry brush manis is the grungy look and often contrasting colours. So I set about creating a new and improved dry brush that I might like more. So I went for very 'me' colours to do that. I started out my mani with 2 squishy coats of OPI Super Cute in Pink from the Hello Killy collection (a lovely gift from my friend Jen from My Nail Polish Obsession when we met up recently). Super Cute in Pink is an orchid crelly which is opaque in two coats with a super shiny squishy finish. The formula was really nice. I then used Pipe Dream Polish V.I.P. Pass (A Night in Vegas Cremes) and Harlequin (Street Carnival Collection) for the dry brush, using short, random strokes of colour all over my nails. I then added a touch of glitter using OPI Starry-Eyed for Dear Daniel (also from the Hello Kitty Collection) using the same method. I finished everything off with topcoat as always. I succeeded in doing myself a dry brush mani that I actually really love! I love the girly feel and the subtle effect using all pinks and purples, and of course the touch of sparkle. I hope you like it as much as I do! Don't forget to check out what the other Digit-al Dozen ladies have done today! Hi everyone! Today I have some exciting news (as you probably saw in the title...lol!) I am joining The Digit-al Dozen and today is my first post! 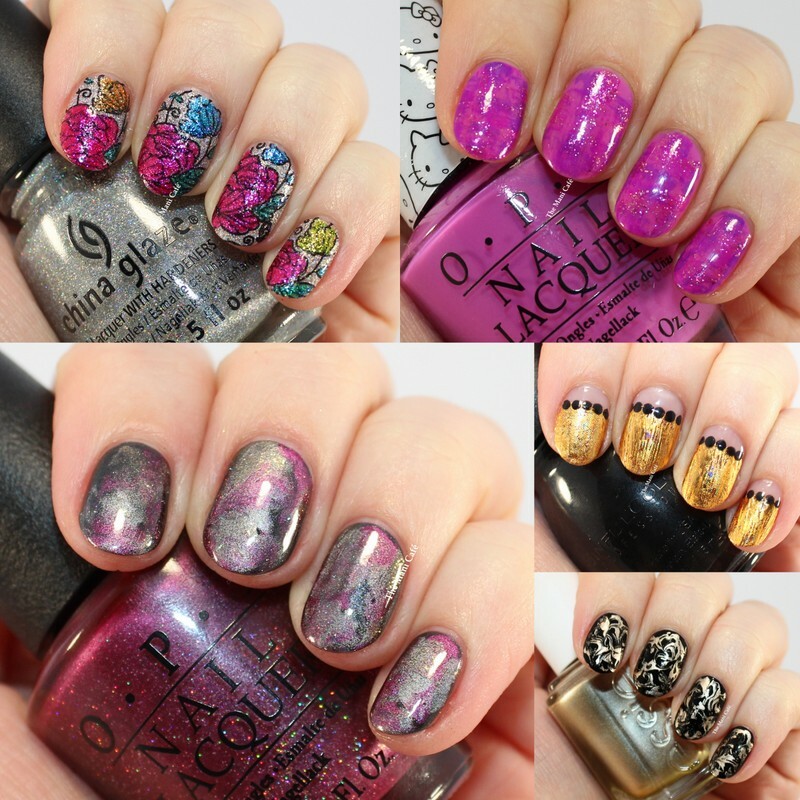 The Digit-al Dozen is a group of nail bloggers who post nail art based on a different theme for a week each month. You can find out more on the Digit-al Dozen Facebook page and Instagram. This month's theme is New and Improved! I'm looking forward to seeing what the other ladies come up with and sharing my designs with you! I am starting out the week with a dry marble mani. Dry marbling is a technique that I have done before but feel I could improve at. My previous attempts at dry marbling were just okay and I don't think I've ever posted any on my blog. So here is my new and improved version. I think the choice of colours and finishes has a lot to do with the final result when dry marbling and I'm quite happy with how this one came out. I chose a black and gold colour scheme as this was actually my mani for New Year's Eve! I used 2 coats of Kiko 275 and while the second coat was still wet, I applied dots of Essie Good as Gold and marbled the two colours together with a small dotting tool. I like the abstract, swirly effect and the mix of the creme and metallic textures together. I think this came out better than any of my previous attempts and I may try some more dry marbling soon! You can see what the other Digit-al Dozen girls did for Day 1 of New and Improved week below! Hi everyone! Today I have a cute polkadot and bow mani to show you! This is actually another mani I wore close to Christmas but didn't get around to sharing here with you until now! I loved this for the festive period but I think it is also cute for any time of the year, especially in different colours. I started out with 2 coats of OPI Road House Blues from the 2011 Touring America collection which is a gorgeous rich dark blue creme with a fantastic formula. This is one of my favourites in my OPI collection. It's such a classy and timeless colour and I never get bored of it. I also really love how it looks with Essie Good as Gold in this nail art! The contrast is so pretty! For my design I used a dotting tool to add polkadots to all my nails except my ring fingers. For the accent nails I used the regular polish brush to freehand a basic bow shape. I then used a fine detail brush and dark blue acrylic paint to add the details. I then finished everything off with topcoat as usual. I really enjoyed wearing this mani, despite its simplicity. It felt very glamourous and classic and reminded me of wrapping paper and bows. I forget how much I love a good polkadot mani and I have a feeling I will be doing a few more in the near future! Hi everyone! Happy New Year! I'm afraid that today I'm playing catch up on my holiday manis. I recently wore this combo and didn't get to show you yet. Sorry about that. I do think its really pretty though so I did want to share it! This is actually the mani I wore for a Christmas lunch recently. I needed something festive but quick to do and it has been ages since I did a glitter gradient! I started out with 2 coats of Zoya Ivanka, from the 2010 Sparkle Collection, a 'sparkling emerald green metallic'. This shade is gorgeous and a must-have from Zoya in my opinion. The gold glitter in the green base is just so pretty and works amazingly for the festive season. Though I would wear it any other time as well! The formula was good and I had no issues with application. For the glitter gradient I used Deborah Lippmann Boom Boom Pow and a sponge to apply it. I find myself coming back to this polish quite often for gradients etc. It has a mix of glitter and real gold 'dust'/flakes and it blends nicely with the gold shimmer in Ivanka. The combination of these two is really blingy and in your face. I loved wearing this mani. What do you think of it?